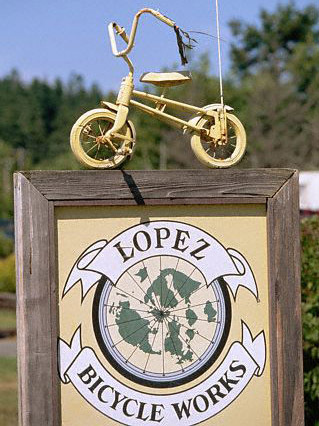 As the road curves around the bend surrounded by forest and rolling pastures, you'll come across the first of Lopez Island's short hand. Notice the big yellow bicycle hung on the barn at Fisherman Bay Road. That's as close as you'll come to a billboard on Lopez. It matches the bikes available at Lopez Island Bike Works across from the marina at Fisherman Bay. Take that main curvy road toward Lopez Village. First you have to pass Lopez Island Vineyards. Actually you don't have to pass it. You can get out and take the self-guided tour. Soon you'll come across the newly built Community Center on the right, the center of art, dance, storytelling and community pot lucking that binds this small clan together. Lopez Village is a beautiful clover of shops and restaurants. Look for the live music and ice cream stands which all lie in the center, if you come on a Saturday in the spring or summer time, you can experience one of the many neat things about Lopez which is the Farmers Market. 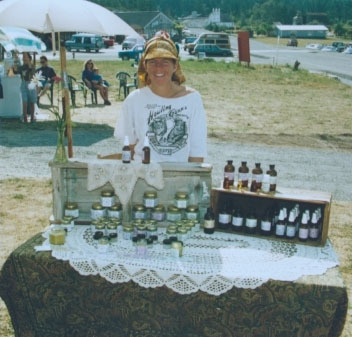 The Farmers Market is open Saturdays: 10:00am to 2:00pm, June - September Only. If you are thinking about coming to Lopez in the summer, make sure you come on the 4th of July. 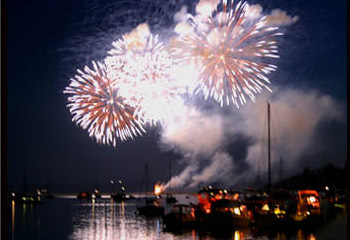 The firework show is spectacular, and said to be the best out of the islands, trust me you will not regret watching it, but before the firework show there is an annual parade, which is great for the whole family.